In Pictures: Amritsar's Exquisite Colors ~ The Wandering Soul's Wander Tales.. Most of us here do share a fascination with Pakistan! I have always wanted to visit that side of the border but I mostly knew the closest I can ever get to Pakistan would be only to the Wagah-Attari Border. 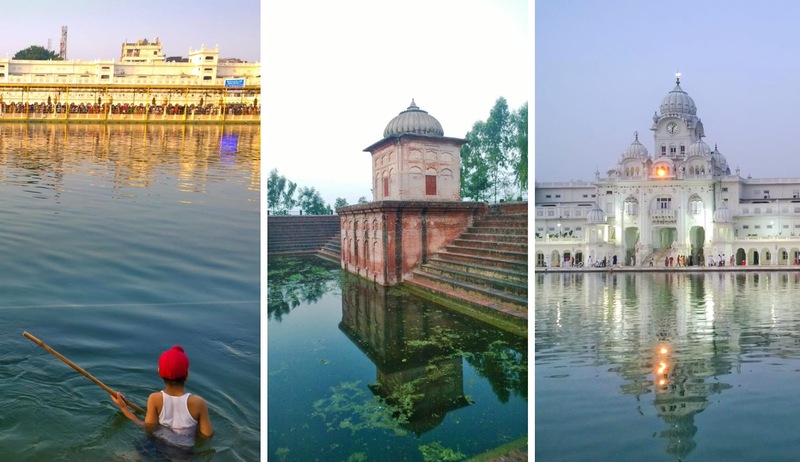 So when the folks at Microsoft Lumia invited me to go on a trip to Amritsar, I jumped at the opportunity. Situated 25kms from the city of Amritsar, Attari is a village 3kms before the India-Pakistan international border at Wagah. The pleasant surprise after reaching Attari was that Punjab Tourism had arranged for us to be seated right next to the Iron Gate on the Indian side. Across the gate was Pakistan! I looked that way more than I watched the Indian side- so tantalisingly close, yet so unreachable. Since 1959, an elaborate border ceremony has been staged every evening and continues till date. Michael Palin called this ceremony "carefully choreographed contempt" and I think that's an apt description. Tall people from Border Security Force (India) and Pakistan Rangers (Pakistan) march, salute, stomp and enact aggression. Respective country folks are incited to cheer for their country and the audience is more than happy to indulge in the shoutfest. Just before sunset, the iron gates are opened. The flags are simultaneously lowered and folded. Then the soldiers retreat with the flags and the iron gates are shut. It's a strange ceremony between two countries that share so much history and animosity. It's interesting nonetheless and it's the closest I'll probably get to that side! Flags being lowered at sunset at Wagah Border. Window to Pakistan, the other side! From where we were sitting, this was the view right next to us. The arena filled up eventually but compared to that side, there was a sea of humanity on this side of the gate, obviously. Do you recognize anyone here? Yep, that's the cast of Khoobsoorat promoting their movie. It was really funny to see Fawad Khan sitting on the Indian side listening to all the cheers of Indians against Pakistan. I wonder which PRs sick idea was it to get him to the border! I keep saying I'm not a temple person and I keep getting blown away by temple after temple! Getting up at 3.30AM is not exactly my idea of fun but hey, duty calls! We were on our way to witness the Palki Sahib ceremony where the holy book, Granth Sahib is moved to the sanctum in a palanquin. We did see the procession but what blew my away was the beauty and serenity of the Golden Temple. In the night, the temple glowed and reflected in the pool of nectar surrounding the structure. By morning, the red of the sun reflected in the holy waters. The temple itself, at the centre of the pool was extremely beautiful with intricate marblework with embedded gems quite similar to Taj Mahal. Inside, every inch of the wall and ceiling was covered in elaborate designs made of gold embossing and other bright colors. I was lost in the two floors of the sanctum marvelling at the intricacy of the fine Sikh craftsmanship. When the sun rises, the first light falls on the temple and it's easily one of the best times to visit. In the pool of nectar, as it's called, there are huge fishes that add color to the scene. In the centre, however, is a devotee taking a holy dip before visiting the temple. Thousands of pilgrims throng the temple everyday and they bring such a huge array of diversity and color with them that it is fascinating to just watch them go by. This was the view that greeted us 4 in the morning! The reflections of the temple and the watch towers were so impressive that I kept staring at the view. Women adding final touches to the rotis in the community kitchen called Langar where free food is served to everyone visiting the Gurudwara irrespective of any distinctions. The whole of the roti making process is automated, just the last step of applying butter is done manually by the women. Golden temple, seen through the foliage. After the visiting the Wagah Border and Golden Temple, our group descended upon the old streets of Amritsar. I wasn't sure what I would photograph in the city but the old city turned out to be quite colorful and really really old. Every lane had interesting visuals and the colors were mindblowing. Add to that, I was shadowing the talented Sid - The Wanderer who specializes in street and portrait photography. So, with the help of an inconspicuous camera and an expert I actually quite enjoyed taking these street shots! Show me blue and I'm already in love with the place. For some strange reasons, many of those old city lanes were bathed in generous blue. We called him the Afghan Guy, he had the look. An old abandoned temple right in the middle of the lane was painted all in blue. Blue, pretty and ruined - I can easily spend hours here photographing but we made it out in about 10 minutes. But there was lot of food! Note - My trip to Amritsar was hosted by Nokia India. Hey Neelima, 4.00 am Golden Temple picture is very serene! Enjoyed reading Wagha border ceremony details. Thanks Shilpa, was so sleepy and tired but it was worth it, the early morning visit to Golden Temple. Each and everyone of those photos are stunning! Been dying to visit the Golden Temple… fingers crossed! Fabulous post and I loved your pictures. Wonderfully done with the phone camera. Indeed awesome. Your post brought back memories of my visit to Amritsar in 2013.